I was recently introduced to the concept of step wells while reading the latest issue of “The Intelligent Optimist”. 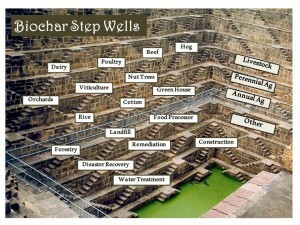 Step wells are magnificent manmade structures most commonly found in India. 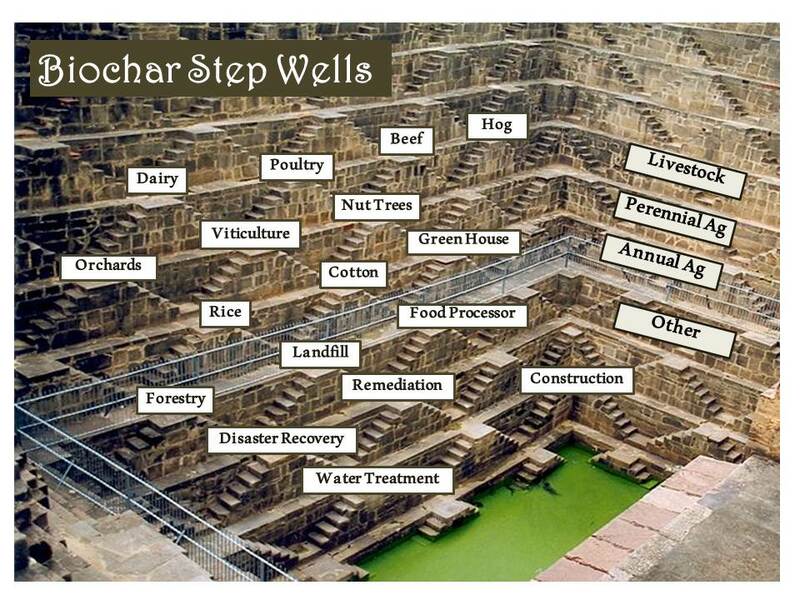 These deep water wells sometimes contain thousands of steps and date back more than 2,000 years. Since part of my brain seems to have turned into biochar over the past few years [i.e. high carbon, adsorptive, sequestering all manner of charcoal trivia, etc.] the picture of course reminds me of the cascading uses of biochar concept, first articulated by the Ithaka Institute (download a great presentation on it here). As I’ve delved into the economic impact of using biochar within different agricultural settings, I am increasingly convinced that biochar cascades are the best approach to building a viable biochar market. The current price of biochar is still relatively high which makes the business case a tough sell if you are ‘just’ using it to increase crop yield. The math just doesn’t work for many cropping systems. Let’s take corn and soybeans as a few examples since these crops make up a huge percentage of US farm land. In a good year these crops will gross less than $1K per acre (e.g. CORN: 2013 average was ~159 bushels per acre * $4 per bushel = $632/acre; SOYBEAN 2013 average was ~43 b/acre * $9.50 per b = $409) after much hard work, increasing expenses plus the stress of watching Mother Nature throw all manner of curve balls year after year. Adding even one ton of biochar would not only wipe out profits, but it would turn profits into losses. To break even, assuming you were able to find biochar at $600 per ton, you’d need to nearly double corn yields. [Most studies show that far more than one ton per acre is needed for yields to increase in most soils.] I wish it were otherwise but yield increase alone is not going to sell biochar, at least for most annual cereal crops in US soils (vegetables might be a very different story as is using biochar in severely depleted soils such as in Africa). But with the cascade model, the economics of biochar begin to look very, very promising. 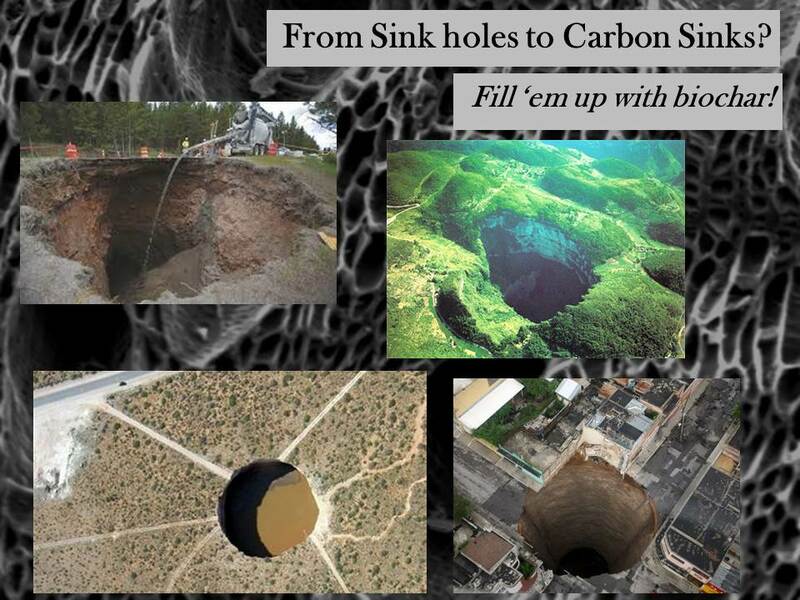 There are a growing number of biochar cascades that are only now being identified so this notion of a Biochar Step Well with multiple cascades which all ultimately lead down into the earth might be a great metaphor for creating a successful biochar industry. Much work needs to be done to validate and quantify the benefits for each of the different cascades, but that is beginning to happen and I’m excited to be a part of it! Recently I’ve seen a few articles that seem to be blurring the lines between biochar and torrefied wood, also called ‘bio-coal’. These two products can pass for identical twins to the average consumer, but really they are only fraternal twins (like me!). Why so? Well basically certain physical and chemical properties are different due to differences in the production process. Bio-coal is produced at lower temps (i.e. 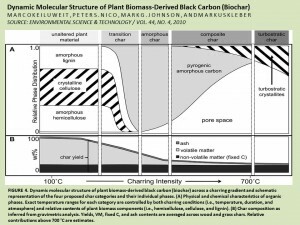 200 – 300C) as compared to higher ones for biochar (i.e. 400 – 800C). At temperatures below 270C the effect is basically to dewater the material which is really the main goal for torrefaction since the end use for this product is generally as renewable fuel. Of late there seems to be more talk of using it as a replacement for coal in electricity generation if the economics can work out (seems to be selling for <=$200/ton from what Master Google tells me). Temperature has a huge impact on recalcitrance (resistance to decomposition), pore size, surface area, pH, nutrient content, volatiles, carbon content and more which are all important if you are using the char in the soil. Have a look at the figure below which shows this in more detail. If consumers are looking for improved crop yield (not the only reason by a long shot…more on that in future posts) using biochar, then it is important to ‘know what you sow’ from a biochar perspective. Renewable energy may be created during the biochar production process – some systems allow for the heat to be utilized and others do not. But biochar should not be considered as a renewable fuel! 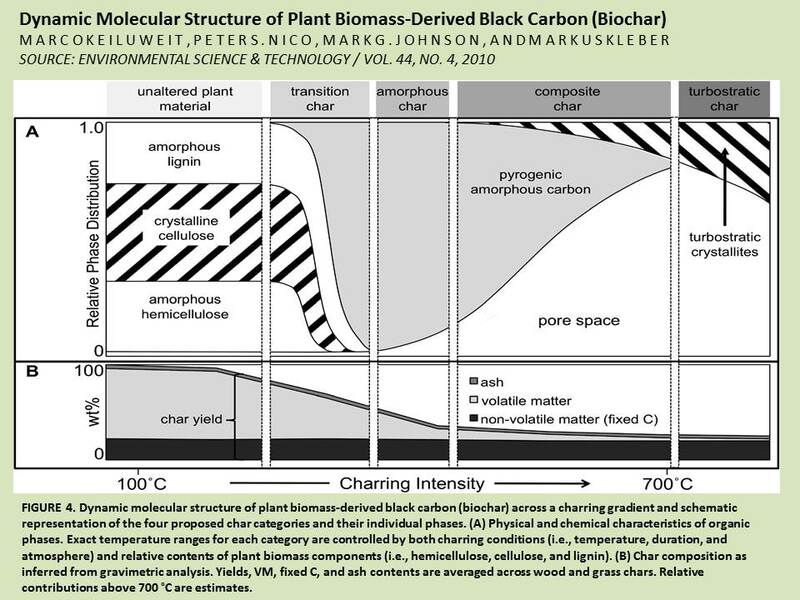 One of the primary end goals of biochar is to impede some portion of the carbon captured during a plant’s lifetime from returning to the atmosphere. Burning biomass to ash doesn’t accomplish that goal though it is still a huge improvement over burning coal or any other fossil fuels. Let’s say the landfill operator invests in some state-of-the-art pyrolysis equipment (one example here which actually generates electricity) so that they can continue to accept yard waste (which is being outlawed in a number of states due to the scarcity of local landfill space). Not only can the yard waste tipping fees keep adding to their coffers but it could be converted into biochar which could be used as a very effective ‘daily cover’. The federal government requires landfills to apply a 6” layer of daily cover which is meant to reduce pathogens, fires, flyaway garbage and lest we not forget the lovely aroma that often wafts away from overgrown rubbish piles. 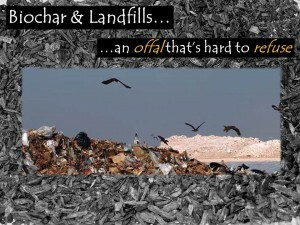 Landfills use a variety of different materials for daily cover depending on availability, cost and local regulations. 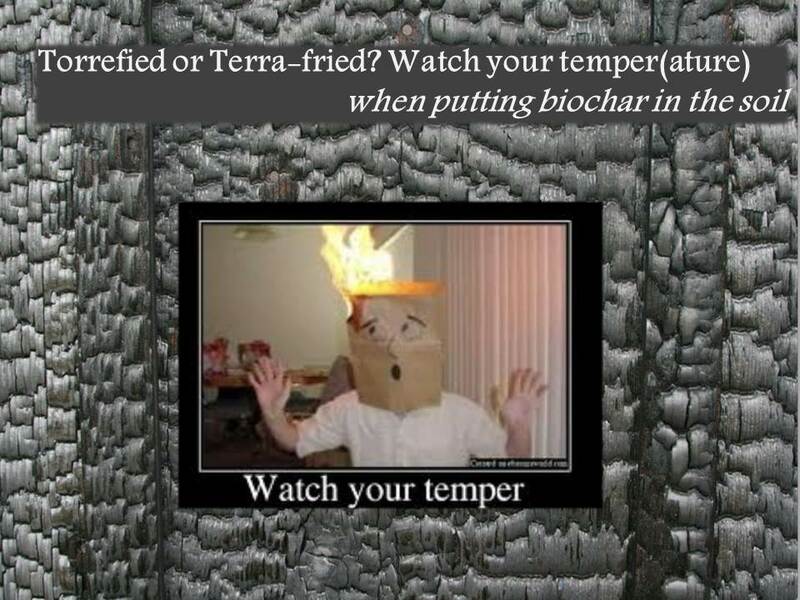 Substituting biochar as a daily cover could be advantageous for all sorts of reasons. The University of Illinois has been studying the ability of biochar in landfills to suppress methane with promising results so far. Other researchers are studying the ability to use biochar to clean landfill leachate in microbial fuel cells. Early results show activated carbon to be more efficient, but I suspect there are ways to tweak the biochar production parameters or the biochar could be magnetized to improve the filtration capabilities of biochar. This could be a huge savings as some landfills end up having to ship leachate off to a waste water treatment facility if they cannot process it on-site. Perhaps the most interesting one for those that live in the vicinity of landfills is the ability of biochar to suppress “l’eau du dump”, that unforgettable smell that permeates neighboring air. 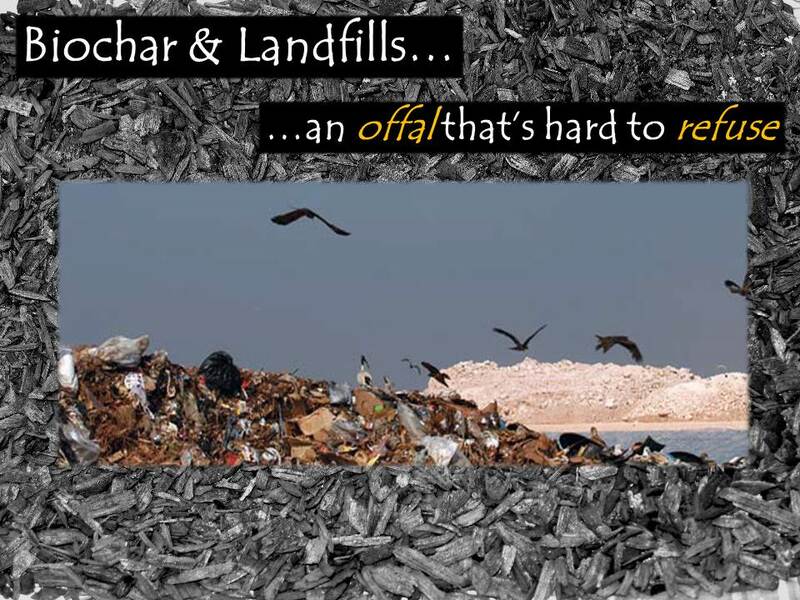 Using biochar as a cover material would likely substantially reduce the amount of sprayers that some landfills use to mask the nasty odors (what is in that stuff one wonders?). At the end of the landfill’s active duty, biochar could also help with re-vegetation, something that can be problematic or at least expensive in some areas. Last but definitely not least in the benefits equation, is all that carbon that landfills will be able to sequester. While it may not be worth money yet in the US, the day when biochar is a viable carbon offset is coming! 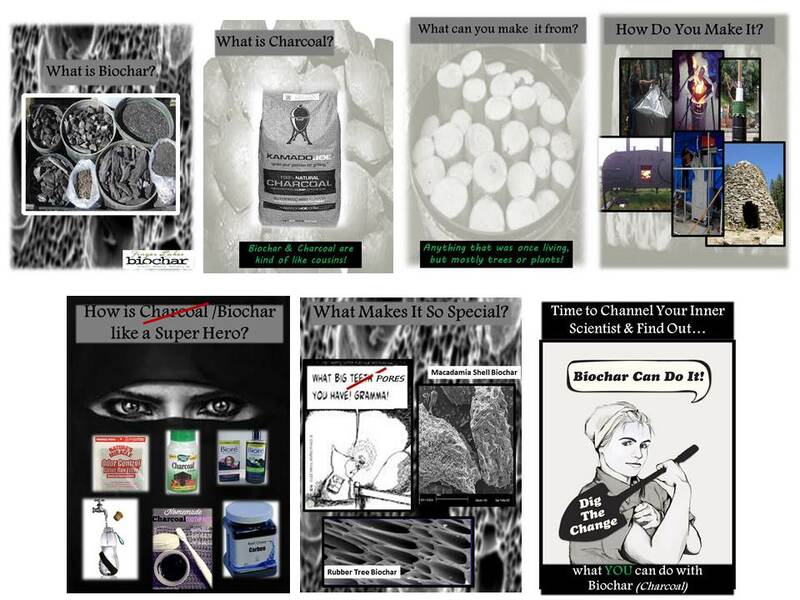 There are biochar aficionados and then there are the ‘cHardcore’ biochar aficionados. I used to think I was in the latter category, but apparently not. 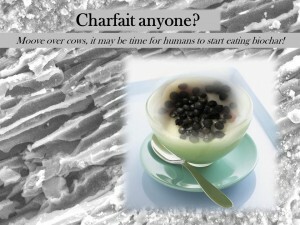 Recently the CHartist informed me that he consumes biochar with yogurt on a daily basis. Not long ago another biochar buddy told me that she is a char chewer AND has started to brush her teeth using biochar. Suddenly I felt that I just might be missing out on something really good here. Although I am aware of many of the benefits of feeding biochar to animals, and I know that vitamin shops sell activated carbon for humans, for some reason I just hadn’t taken this next step on the char ladder. Could this one minor change to eating habits be one small step for mankind and one giant step for the planet? I admit that is too big a question for me to answer in one small blogpost but still something to ponder! It’s not that I am a total char ingesting virgin mind you. The Biochar Knight was kind enough to bring biochar covered peanuts to the 2013 Biochar Symposium so I had a little nibble there (I’m very curious as to whether this combo would make nuts safe for those with peanut allergies!). But biochar in my yogurt? This morning I took the plunge (ok really I just dipped my toe in since I only ate one spoonful!) and I have to say, well, my puppy and cat loved it! Me, not so much. Perhaps it was the size of the biochar I used. The ones pictured in the (heavily doctored) pictured above show biochar made from cherry pits and boy were they crunchy. Next time I’ll have to try some biochar which is more powdery – like biochar made from coffee chaff. Of course I had to google around to learn more about the benefits of ingesting charcoal or activated carbon. Although it is definitely not a new practice, one of the questions that occurred to me was whether it could help with the bioaccumulation of certain metals like mercury which seems to be increasingly prevalent in the air, in rivers and in some of the sea food that we eat. Or could it help purge the accumulation of the arsenic that is increasingly being ingested via apple juice or rice. Both of these seem to be in the news a lot more recently and few treatments seem to be available and the treatments that are available seem to be costly. How fantastic would it be if some kind of ‘Charfait’ product could sit along-side the pro-biotics that can be found more and more in our grocery stores? 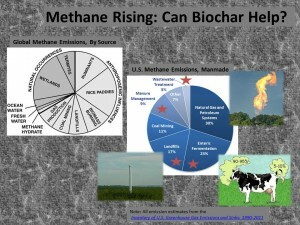 Methane Rising: Can Biochar Help? Methane (CH4) has been in the news of late. Seems that everything from flatulence to fracking is contributing to the precipitous rise in CH4, which is more than a tad frightening given that it has 34 times the warming potential over 100 years as compared to CO2. The only good news is that methane doesn’t last long in the atmosphere (8 – 12 years) so if we get our act together we could correct the imbalance in the near future. Mother Nature and mankind both belch out CH4 but the ratio has definitely tilted more heavily towards anthropogenic sources. It seems unlikely that biochar would be able to positively impact Mother Nature’s emissions which largely come from Wet Lands or termites (but who knows, maybe if biochar could somehow be added to the termite diet it could reduce emissions!). 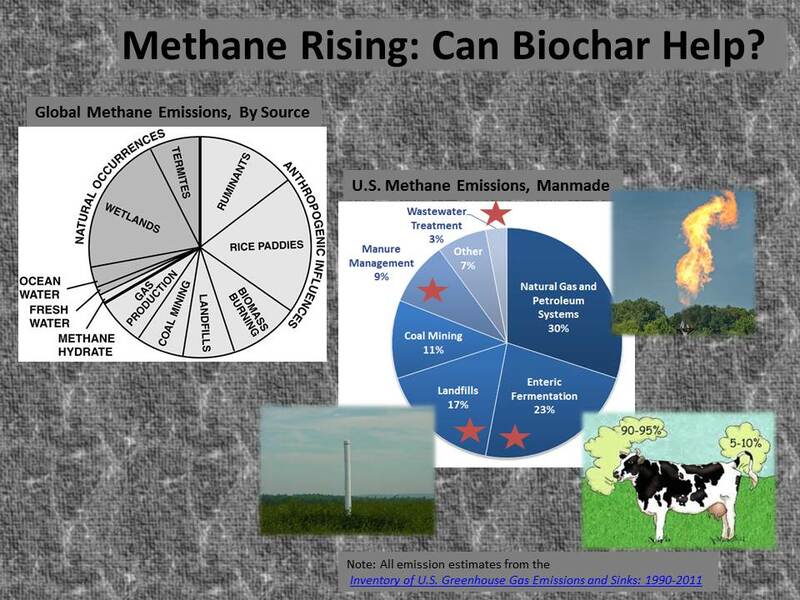 Emissions attributable to we humans is another story – there is LOTS of potential for biochar to allay the methane malaise. As I’ve mentioned in an earlier post, biochar + livestock is a love connection in terms of reducing methane emissions related to ‘enteric fermentation’ (i.e. burps, etc.). While the amount of CH4 produced by livestock varies depending on a number of variables, adding char to feed shows promise in significantly reducing toxic burping. The combination of manure management & biochar is already happening in a number of different ways. Some companies are turning manure directly into biochar. Other research is looking at combining biochar in anaerobic digesters fueled by manure. Still other research has demonstrated that composting manure with biochar can reduce CH4 emissions. Similar to manure management, wastewater treatment could likely benefit from biochar but I haven’t gone down that path too much as I suspect some of the heavy metals in wastewater treatment could render the biochar unattractive to end users so finding a market for the char could be problematic. The US doesn’t have lots of Rice Paddies, but these are another source of methane. Though I haven’t come across any research on biochar’s impact on CH4 emissions, the use of biochar in rice fields has been shown to reduce nitrous oxide (N2O), yet another GHG, in rice fields! Overall, not a bad outlook for using biochar to reduce manmade GHG emissions! I am excited to be providing a little biochar education to lower school kids at Allendale Columbia within the context of their revamped STEM program next month. Teaching little ones about the benefits of biochar makes me think hard about boiling down the key information to the most basic level. Since few adults, let alone kids, have ever heard the word biochar, I am going down the ‘what is charcoal’ path just so they will at least have a point of reference (I may have to grill them on the differences though!). In the past, the whole charcoal-biochar confusion often made me fume, but I’ve been warming to the idea (over some slow burning embers of course) over the past year or so! As I research how charcoal has been used through the ages, one cannot help wondering how the idea of eating charcoal to neutralize poisons ever popped into someone’s head or the notion of brushing your teeth, cleaning your skin, purifying your water or many of the other seemingly endless uses for biochar that ancient civilizations conceived. Derring-do or desperation? Curiosity or Happenstance? The rationale for putting charcoal in the soil though, seems a bit easier to unearth. Early humans may have seen that forests or fields burned after lightning strikes resulted in more vigorous growth. Or perhaps before abandoning campfires women covered them with dirt to prevent larger fires and subsequently noticed that plants grew better atop the charred remains of ‘expyred’ campfires. Whatever the reason, whomever the ingenious souls, millions have benefited from the various uses of charcoal across the millennia. Ideally education, in my humble opinion, should seek to re-ignite these seemingly ancient powers of observation, of drawing conclusions from real world actions, as well as inspiring the curiosity to try new and different things. How to weave all of that into a narrative that kids will get excited about is the challenge. The picture above is my attempt at creating that story (wish me luck!). The 2nd graders will be experimenting with water filtration projects using biochar and the 3rd graders will be performing experiments with growing plants in biochar. Should be fun! Considering the increasing number of devastating climate events that are felling forests (and buildings) faster and faster, it seems to me that Mother Nature, in her moments of ire, is providing plenty of carbon fodder which could be used for sequestration. 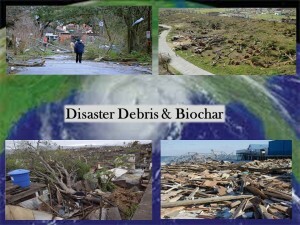 Debris from these ‘natural’ disasters often gets shipped off to landfills. Some, including the Rocky Mountain Institute, are advocating for this kind of debris to be shipped off to biomass generators to offset fossil fuel energy generation. A better if not best option IMHO. Hurricanes Katrina & Rita alone were responsible for killing 320 MILLION trees. I have absolutely no idea how much carbon each tree might have had on its dying day, but I do know that all of that will go back into the atmosphere if it is chipped & burned. Let’s ponder the possibilities of pyrolyzing these piles for a moment. I posed the question to a forestry friend of mine last night and just for giggles, we assumed the average tree weight was 1,600 lbs and 25% was carbon or 400 lbs per tree. Converting this biomass to biochar could sequester up to half of that carbon which would be something like 64,000,000,000 lbs of Carbon. Then do the math on the CO2 equivalent for that carbon and we arrived at the exact figure of ‘nothing to sneeze at’ especially when you consider the alternatives! At the same time the biochar produced can be used to rebuild the soils that have been damaged by sewage or other bio-hazards. As an example Tropical Storm Irene damaged more than 20,000 acres of farm land in Vermont alone and washed away countless tons of topsoil. Biochar could have helped to restore much of that damage and prevent plants from taking up some of the toxins. 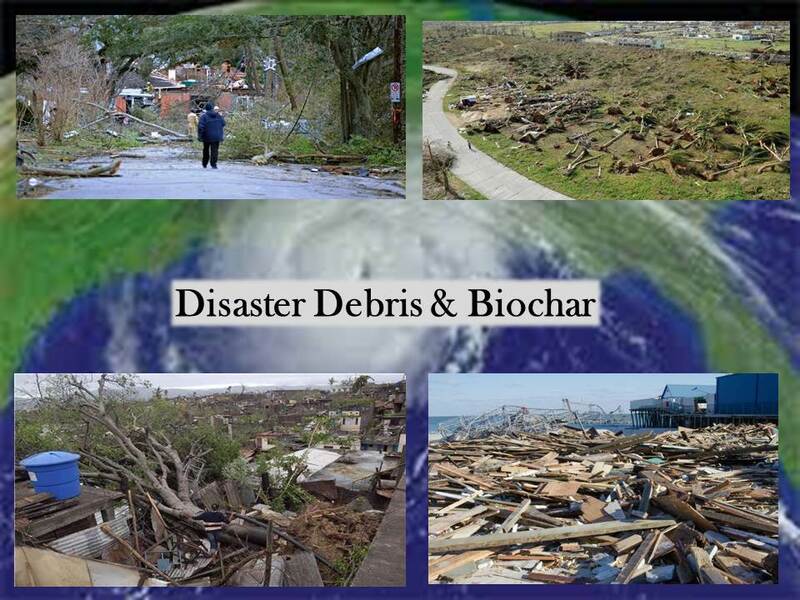 One of my latest projects includes working with an incredibly knowledgeable retired FEMA manager on the design of a scalable template for debris management which includes biochar. The model is looking at how communities could/should include biochar in not only disaster or emergency management of debris, but on-going management of yard debris. Next up we are planning to design a prioritized list of end-uses for the biochar based on the needs of the community. The ways that biochar can be used are not limited to remediating or rebuilding eroded soils, but can include use as a building material to rebuild homes, retaining walls and several other long-lasting products. With the increasing number of affordable and portable technologies available which can convert wood chips into heat, electricity and biochar, I can see the day when many disaster-prone communities have a pyrolysis unit at the ready to handle ice storm debris, tornado detritus, or the wreckage which follows hurricanes. Turning the downed biomass into biochar could go a long way towards helping both communities and the planet to recover. 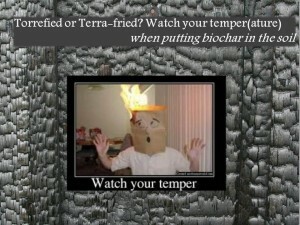 Don’t ask me how this latest use for biochar popped in to my head. I suspect it was a combination of reading this article on the Ithaka Journal which talks about how a dead rat was buried in charcoal and decomposed with nary an odor plus thinking about sink holes plus thinking about one of my favorite profs at grad school who is launching a green burial business in Texas. Regardless of how this somewhat morbid notion found its way in to my brain, I think I may have unearthed a way to make burials greener than ever before. Green burials, for those that have not heard the term, are all about taking the nasty chemicals and non-biodegradable materials out of the current burial traditions commonly practiced in some westernized societies. Little did I know just how much wood, steel, concrete and embalming fluids are used, suffice to say heaps! Rest peacefully dear reader, I am not going to suggest we bury our recently departed brethren in a cigar box filled with biochar as the researchers did in 1853. What could be really novel and much, much better for the environment though, would be to replace burial vaults (a concrete tomb the caskets go in to prevent cave-ins after the caskets have disintigrated) out of biochar. Crazy? Not completely, especially when you consider an entire house has already been built with biochar. Just think how much happier the soil critters would be with biochar buried deep in their midst instead of concrete. 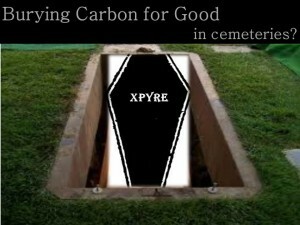 Why stop with burial vaults when caskets could also be molded out of biochar too (imagine the ‘xPyre’ model!). In traditional cemeteries the mausoleums and headstones could even be made out of biochar saving all that granite, marble and cement for more animated uses. And just to lay to rest any lingering concerns you might have, some researchers believe that the ancient civilizations that created the original Terra Preta soils, may have entombed their dead in charcoal leading to the creation of ‘necrosoils’. (sounds like something in a bad video game). Everything old can be new again! 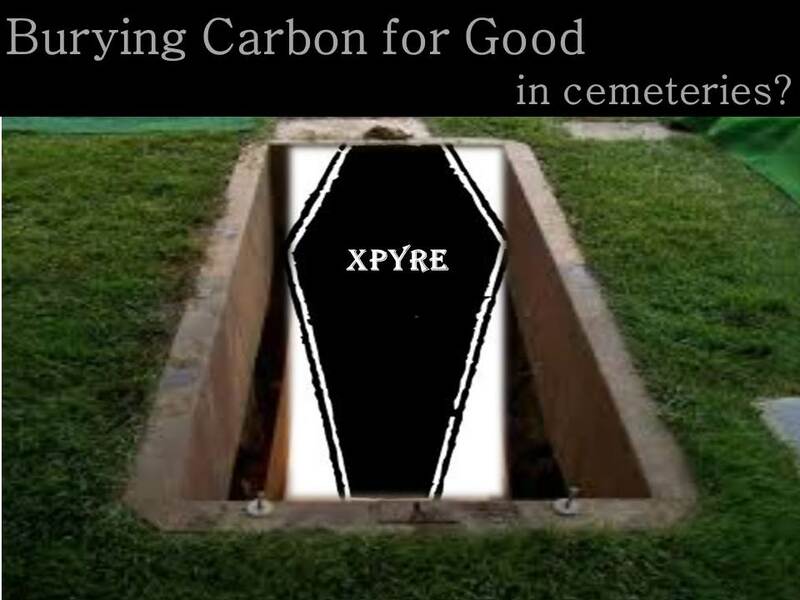 So green burial industry, perhaps it is time to get started exploring how biochar can make your industry even greener by burying carbon for good! For no apparent reason, I seem to have a perverse fascination with sink holes. I’ve never seen one up close nor do I live in an area of the world where they are common. But it seems to me that both the frequency and the parts of the world where they are occurring are on the increase. Every time I see a new story on the latest sink hole, I spend a few minutes flirting with Master Google to learn more about them. Regions with cavities in the earth’s surface are usually where sinkholes are most likely to occur, be they from Mother Nature (e.g. caves or aquifers) or from mankind (e.g. abandoned mines or sewage lines). Changes to these cavities resulting from downpours, droughts and fracking are often the cause and there seems to be a lot more of all three of those these days! What to do with a giant hole in the ground? In ancient times sinkholes were often used as a sort of landfill which could lead to polluting of groundwater. Nowadays there are different solutions to sinkholes from converting them into lakes, to filling them with cement or grout. In extreme cases, communities have been forced to flee the area or risk being swallowed up! How to go from sinkhole to carbon sink – to turn the abyss into something better if not quite bliss? With biochar of course! I’m really treading on shaky ground here from a science perspective, but it seems to me that instead of drilling & filling with grout or concrete, a better solution might be filling up the nooks & crannies with biochar. Not only would this probably allow water to filter down to recharge aquifers more quickly, it would likely help filter toxins and thus keep them out of the groundwater or in the case of the ever expanding Louisiana sinkhole, it might help mitigate some of the H2S or methane that seems to be percolating up from the ground. And the silver lining? LOTS of carbon sequestered! Just how much CO2 could be sequestered in this manner is a little hard to calculate. But considering just this one hole in Guatemala was 100’ deep and gobbled up 6,500 square feet of concrete in an attempt to put a band-aide on the gash, there seems to be a plenty of room to bury this highly stable form of carbon in the ever growing number of sinkholes. It might be interesting to explore this idea with old oil wells too. Texas sure needs some help recharging their aquifers these days and they have a heck of a lot of old oil wells dotting their landscape. A few days ago, I took my sleepless night idea, the Terra Pee Pad for puppies with small bladders, to the next level and made a V1 prototype pictured above. Making it was fairly simple. I purchased a roll of biodegradable landscaping fabric (could not believe I’d find that in January) and sewed up the sides. Inside I added a few pounds of a biochar + vermicompost mix that I had sitting around and then sewed up the top. As some of the finer particles of char can escape this kind of fabric, I put the Pad in a low box so it wouldn’t make a mess on the floor. The results have been interesting. While I would love to claim that puppy trotted right over to it for a quick pee on the pad, she has taken awhile to figure out that there is a preferred spot for doing her business, at least in my humble opinion. Having said that, she has now started to use the TP pad for its intended use and more. I am happy to report my human nose could detect ZERO odors after several deposits. I shouldn’t be too surprised with that, but what did surprise me is that the canine nose apparently has no issues with it either. How do I know this? Well puppy doesn’t just pee on the Pad, she has slept on it too. Kind of gross, but kind of interesting too. 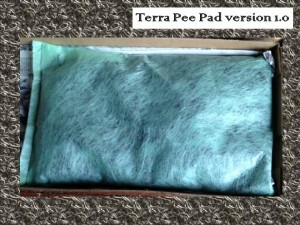 I have some ideas for v2 of the TP pad but I have to say I’m liking the concept a lot so far!